1. Slice spaghetti squash in half lengthwise and scoop out the seeds. 1. Place a metal trivet in the bottom of the Instant Pot. Add one cup of water and place halved squash on top of the trivet. 1. Close lid, turn vent to "Sealing", set the Instant Pot to the "Manual" setting on high pressure and set time to 7 minutes. 1. Once cycle is complete, use the quick release method to release the pressure. Open lid and allow squash to cool slightly before removing from the Instant Pot. 1. Using a fork, scoop the spaghetti strands out of the squash into a bowl and set aside. 1. Heat olive oil in a large skillet over medium heat. Add garlic and shallots and cook until translucent, about 5 minutes. Add butter and parsley and cook until butter is melted. 1. 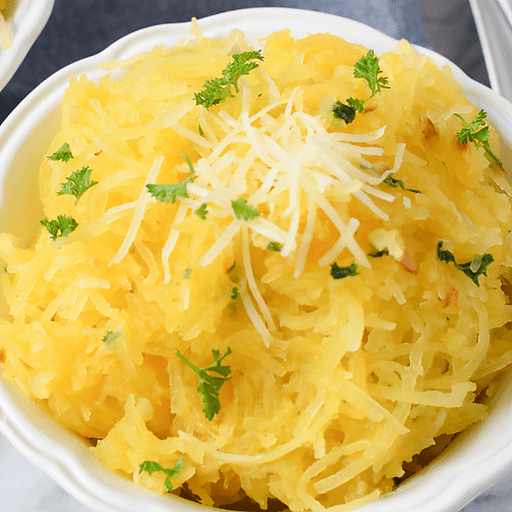 Stir in spaghetti squash strands and cook until heated through. Remove skillet from heat and add shredded Parmesan cheese. Season with salt and pepper, to taste. 1. Serve with additional Parmesan and parsley if desired. Microwave the whole squash for 2-5 minutes to soften the skin and make it easier to cut in half. Pierce the skin with a knife a few times to help it vent before microwaving. Oven Directions: 1. Preheat oven to 375°F. Lightly grease a rimmed baking sheet with cooking spray. Slice spaghetti squash in half lengthwise and scoop out the seeds. Place squash, cut-side down, onto the prepared baking sheet. Roast until tender, about 35-45 minutes. 2. Remove from oven and allow to cool slightly. Using a fork, scoop the spaghetti strands out of the squash into a bowl and set aside. 3. Heat olive oil in a large skillet over medium heat. Add garlic and shallots and cook until translucent, about 5 minutes. Add butter and parsley and cook until butter is melted. 4. Stir in spaghetti squash strands and cook until heated through. Remove skillet from heat and add shredded Parmesan cheese. Season with salt and pepper, to taste. 5. Serve with additional Parmesan and parsley if desired. Calories 110, Total Fat 6g (Saturated 3g, Trans 0g), Cholesterol 10mg, Sodium 140mg, Total Carbohydrate 13g (Dietary Fiber 3g, Sugars 5g, Includes 0g Added Sugars), Protein 4g, Vitamin D 0%, Calcium 8%, Iron 6%, Potassium 6% *Nutritional values are an approximation. Actual nutritional values may vary due to preparation techniques, variations related to suppliers, regional and seasonal differences, or rounding.